After the bombs, they built bridges. Modern day Rotterdam bears little resemblance to the Rotterdam of old, a city reduced to rubble in May 1940 to force a fearful Netherlands into an early surrender so that the German airforce would not repeat the feat upon its other great cities. From ashes and dust, Rotterdam 2.0 would eventually emerge with an ambitious emphasis on experimental structures and new approaches to urban living, whilst preserving its outward looking tilt and an international identity shaped by the river and seas. With world leading architects unencumbered by the need to respect historical skylines or aesthetic standards on a 'blank slate' space, this means that Rotterdam is a city which may not be to every city breaker's tastes; the cobblestones and filmset ready streets of old Europe greats like Amsterdam, Paris, and Brussels are not to be found here, and this is important to know before you arrive. However, for the curious with an appreciation of post-war design and unconventional geometric building blocks, who wish to ride a bicycle over, under, and through these masterpieces, and who adore the sense of visiting a forward-looking city which is not defined by tourists but rather by those who call it home, Rotterdam is the place for you. It's unconventional. It's modern. And it's also (Rotter)damn cool. Here are our favourite things to do in Rotterdam. 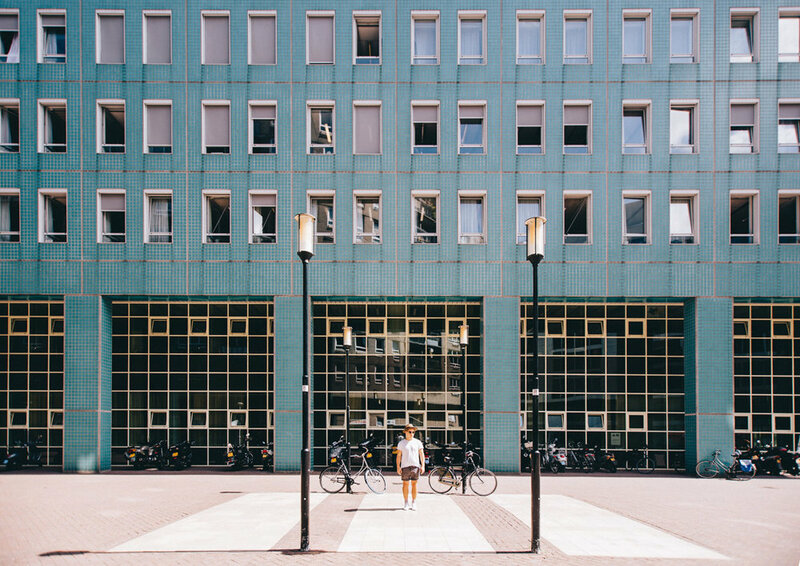 Although we believe that Rotterdam's best works of art are out in the public spaces - its buildings, its street art, and the sculptures dotted around (including the infamous 'dirty santa' on Eendrachtsplein) - the city is also a hub for creatives and artists in the Netherlands. For city breakers, the 'Museumpark' is the main jumping off point for a culture fix. As well as serving as a public green space and sculpture garden, over a dozen of Rotterdam's main art and museum attractions are located nearby, such as the Netherlands Architecture Institute, the Museum Boijmans Van Beuningen, and the Het Nieuwe Instituut (we didn't have time to make it to this and we regret it!). Netherlands Photo Museum (Las Palmas, Wilhelminakade 332) | Open Tuesday - Sunday 11 a.m. - 5 p.m. Entry costs €7 for 18-25 years, 26+ years costs €14. Kunsthal ( Museumpark Westzeedijk 341) | Open Tuesday - Sunday 10 a.m. to 5 p.m. Entry costs €7 for 18-25 years, 26+ years costs €14. The actual name of this elevated yellow pedestrian footbridge is The Luchtsingel, meaning 'air canal', but we christened it 'sunshine bridge' (which we much prefer). The newest addition to the many bridges which span Rotterdam (more on those later), the special thing about this structure, completed in 2014, is that it's the "world's first crowdfunded infrastructure project". Set in central Rotterdam, it had the mission of connecting three hitherto disconnected parts of the city (Central Station, Rotterdam North, and Binnenrotte), specifically aiming to revitalise the 'forgotten area' of the latter. Around 8,000 members of the public signed up and paid €25 each to have their name on one of the wooden slats, helping the designers to bypass a lot of bureaucracy and fund a large percentage of the build costs. It's an engaging design, a wonderful community project, and the bridge brings a dash permanent sunshine to the surrounding grey colour palette. Where | The Luchstingel can be accessed via multiple stairways - this website shows various locations and opening times, or you can simply take the entrance after you've eaten at Op Het Dak. ...and, as the bridge will take you to Rotterdam North, you may as well spend a little time exploring the area too! We strolled around on a Sunday in search of good coffee, and found it under the railway arches at Man Met Bril (Vijverhofstraat 70), a very cool roastery, coffee bar and excellent brunch/lunch spot (although they desperately need to get some oat milk on the menu!). A further walk along Vijverhofstraat, there's the cycle shop and coffee bar called COPPI, which we really liked too. We weren't able to spend too long exploring Rotterdam North, but it quickly gives off the impression that this working class district - the area which many hoped would be revitalised the The Luchstingel - is showing the typical signs of nascent hipster-dom, and so it's likely to see many more cool spots popping up in the next year or two alongside those we didn't have the time to check out. 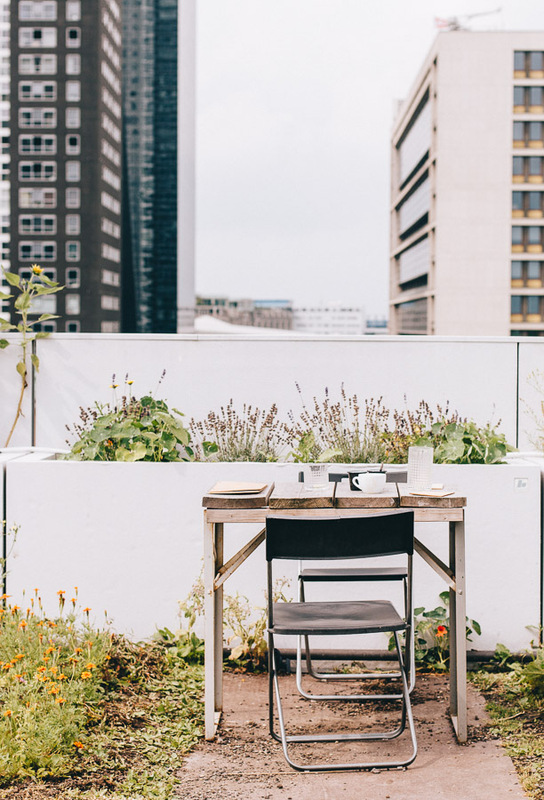 Located just a stone's throw from The Luchtsingel, atop a building filled with creative start-ups, is Holland's first rooftop farm and urban garden. Providing a respite from the tangle of busy streets below, and views out over the city, Op Het Dak is much more than simply a place to eat in Rotterdam; it's an essential spot on any city-breaker's itinerary. Open for breakfast, lunch and coffee breaks, on a warm or sunny day this is an excellent spot for brunch (served until 11 a.m.). Oh, and the freshly squeezed orange juice is top-notch. Where | About five minutes from the Central Station, Op Het Dak is on Schiekade 189. 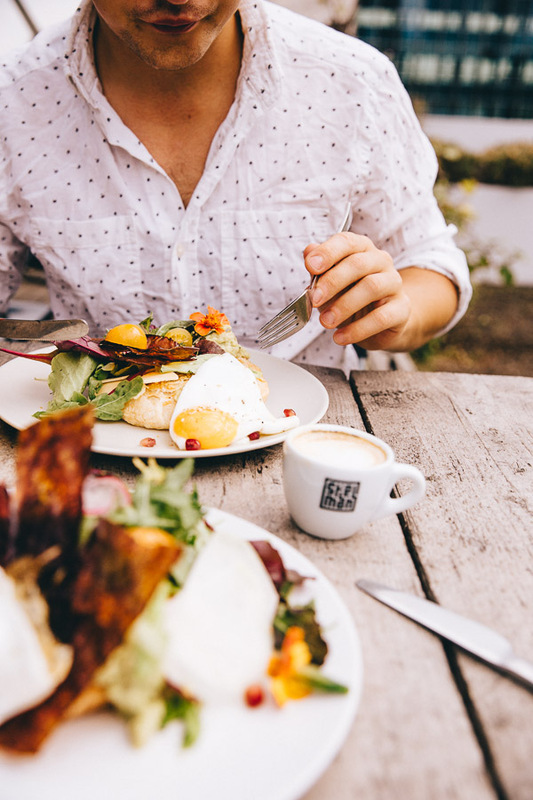 Top Tip | Had your fill of brunch but not ready to get out of the sun? Just mosey on downstairs to the Biergarten. A collection of several outside bar set-ups with abundant seating, a cool sound track and good beer. From what we saw, it's definitely the place to be when summer hits - especially on a Friday afternoon/evening when the party goes off and lasts until late. 1. The city is very cool. 2. We heard that its annual July carnival was great fun. Thankfully, both of those beliefs were solidly reinforced, and we think that the Rotterdam Carnival - which now forms part of the five-day Rotterdam Unlimited festival - is the city's best kept secret. You can read more about our experience at the Rotterdam Carnival here. Jazz lovers should also know that the renowned North Sea Jazz Festival, held every second weekend in July, also takes place in Rotterdam. Needless to say, the presence of two major festivals in the city during July means you should book your accommodation well in advance should you find yourself at either. You should try, and we mean really really try, to arrive in or depart from Rotterdam by train. With the previous post-war station unable to cope with the increasing traffic and links required of a modern European transport hub, a necessary overhaul and redesign was completed in 2014. A shimmering arrowhead covered in, to our eye, a crinkly tinfoil-esque sheet metal, the bold Pythagorean entrance cuts and juts into the sky, pointing towards the centre of Rotterdam (a useful tip if you're not sure of your bearings yet!). It is however the incorporation of the old station's clock and signage alongside this modern design which elevates Rotterdam Centraal Station into something very special. This station is a joy to visit in the daylight, but be sure to pop by once the sun has set for a totally different experience. As we've already intimated several times, Rotterdam is a mecca for modern architecture geeks. We mainly navigated the city on foot, and walking along the banks of the Nieuwe river several times each day let us contemplate just how unique this place is, and how architects with radical ideas must clamour to be commissioned in Rotterdam (or, conversely, Rotterdam is the only place that these architects can go with their commissions!). Clearly, the near total razing of the city following the German bombings (the Grote of Sint-Laurenskerk was one of the few buildings which remained - see this dramatic photo) unintentionally cleared a path for bold, innovative designs where considerations for the past were non-existent. Now, we are not fans of every single new building in Rotterdam - not in the slightest - and we don't expect anyone else to be. 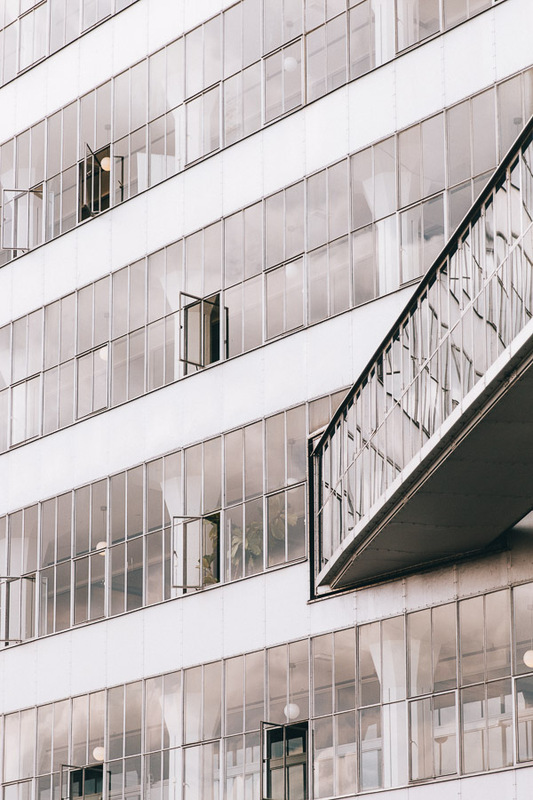 However, it's undeniable that the post-war bridges and buildings parachuted all over to create a city where individual pieces are the skyline, rather than a skyline formed of individual pieces, is a reason why many are drawn to Rotterdam. Erasmusbrug | Nicknamed 'The Swan' (one half of Along Dusty Roads can still not see any reason for this despite multiple efforts to see the remnants of a swan in the design) this white bridge - which includes pedestrian and cycle paths - will take you towards Fenix Food Factory and the Photo Museum. De Rotterdam | Completed in 2013, the three towers remind us of the giant head statues at Rapa Nui / Easter Island. The Police Station | So cool that it's almost worth getting arrested. If you'd like to understand the story of these buildings, and find many other gems, then you can take this highly-rated two-hour architecture tour, run by a local architect. We had a city break in Antwerp not too long before we returned to Rotterdam, and discovered that we have quite a weird fascination with 20th century underground pedestrian tunnels. No no, don't go away - let us explain! Curious subterranean walkways, which still link thousands of pedestrians and cyclists to sections of the city, are fascinating urban design landscapes and often perfectly preserved. So, upon discovering that Rotterdam also has one, we made a beeline for it as soon as dusk began to fall. The Maastunnel, which links the two banks of the Nieuwe Maas river, actually plays a curious role in the history of the bombed-out city. As construction began in 1937, it continued to be built (largely unaffected) by the 1940 bombings, and was completed in 1942 - we are told that the occupied Dutch held a secret opening ceremony away from the occupying Germans. Where | Pedestrians and cyclists can enter the Maastunnel from the south bank at Bezoekerscentrum Maastunnel, Charloisse Hoofd 27, or on the north bank at the entrance opposite Eetcafé Scorpio, Parkkade 27 (a short walk from the EuroMast Tower, from where you can find the best view in Rotterdam). This central artery, lined with bars and restaurants which spill out on to the street, was once considered the epitome of cool, and whilst (according to locals at least) that mantel may now have been lost to the neighbourhoods in the north, it's still your best bet for an afternoon or evening drink - or two - when the sun is high. We certainly found ourselves returning time and time again to Witte de Withstraat (to give the street its full name). 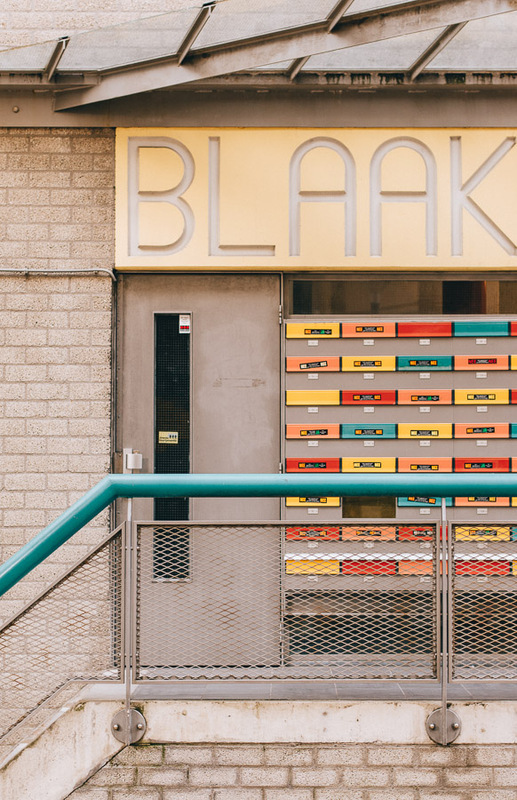 De IJssalon | We visited Rotterdam during the European heatwave and were mighty glad to find this ice-cream spot! Whilst we would probably have been delighted with an icey pole, we were instead blown away by their lemon and mango sorbets. The dairy desserts looked mighty tasty too. Wunderbar | Friendly staff, an amusing menu and good beer is the reason we returned to this fun bar more than once. It also does good vegan food. Witte de With Center for Contemporary Art | Created in 1990, The Witte de With Center for Contemporary Art is an international art institute with Rotterdam as its home base. Regarded as a pioneer in its field, it holds the work of both established and up-and-coming artists. Entry is €6 for adults, with late night openings on Fridays. Collectiv. by Swan | Our purchase of a €25 hand fan made in Ghana is testament to the fact that this shop, run as a co-op, is full of lots of lovely things that you can't help but buying. Just don't hold us responsible if you spend all your holiday money! For urban graffiti lovers, Witte is also the spot which holds the most street art in Rotterdam (or at least so it seemed to us). Just be sure to look up, and venture down some of the smaller side-streets. Tip | If this seems like the sort of place that you'd like to call home for the duration of your stay, then we recommend the popular King Kong Hostel. We don't know what Piet Blom was smoking back in the '70s, but we're sure glad his bizarre concept was given the go-ahead by the local council. Faced with a planning conundrum, the architect Blom was approached to link two plots of residential land separated by the busy Blaak road; his solution has grown into the most recognisable icon, and biggest tourist attraction, of Rotterdam. The Kubuswoningen, more commonly referred to as the 'cube houses', are simply unlike anything else we've ever seen on all our travels. Tilted at 45 degree angles, only a quarter (100 square metres) of each cube's three floors of living space is actually useable - which must make it a bit of a nightmare for full-time residents. However, what they lack in terms of conventional living space, they make up for in the abundance of architectural curiosity and the fascination the invoke in every visitor. We walked through and past this 'urban forest village' several times, and each occasion led to new found appreciation of the angles, the patterns (intentionally created), and the level of creative ingenuity that are represented in a design which still feels daring, even 40 years after. Indeed, without Blom's yellow cubes, we doubt that many of the architectural innovations which continue to find a home in Rotterdam would be quite so welcome. Cost | You can access the exterior of the houses for free, whilst the Kijk-Kubus (Show Cube) is now a museum and open to the public every day from 11 a.m. to 5 p.m. Entry is €3 (note that we didn't go into the show cube so don't know whether it's worth it - let us know in the comments). When | The exterior of the houses can be accessed 24 hours a day. Do note that this is a pretty popular spot in the city, and if you'd like photos without a lot of people in them, we'd recommend arriving before 9 a.m. People still actually live in these cubes too, so be conscious of privacy. Tip | Fancy trying out one of the cube houses yourself? Stayokay Hostel allows you the opportunity to do just that, or you can rent this one on Airbnb. For days, Keilewerf was little more than simply a dot on our ever more populated Google Map of things to do in Rotterdam. Lured by a photo of the fascinating HAKA-gebouw building, we jumped on the metro and headed out into the suburbs with little idea of what to expect. What we found was a creative quarter in the making. Previously disused factories converted into thriving artist studios, large scale pieces of street art, and a revolutionary huge air purifier - part art installation, part bloody useful bit of technology. For now there isn't a huge amount for the visitor, but we would put money on the fact that changing very soon; this is a neighbourhood to watch out for in Rotterdam. Top Tip | In line with its creative roots, Keilewerf is now home to the newest of Rotterdam's summertime pop-ups - Keilecafé. Founded by three men who wanted to create a festival vibe without the fences or entrance fee, Keilecafé offers up world music and local Rotterdam artists, good food and better drinks Thursday-Sunday throughout the summer months. Visiting in the day time, the site may not look like much, but in a city that values the different, Keilecafé has proved quite the hit. How to get there | Conveniently, there is a metro station (Marconinplein) and several tram stops within a few minutes walk. Housed in what was once a forgotten warehouse along the river 'Nieuwe Maas', The Fenix Food Factory is a must-visit for foodies (we preferred it to Markthal) and it's well-paired with a trip to the Netherlands Photo Museum and Hotel New York, both a short walk across the Rijnhavenbrug, and a wander around the wider Katendrecht neighbourhood (see below). With cafes, a brewery, creative spaces, a book shop and some great independent food enterprises all set within its hipster-friendly aesthetic and space, grabbing lunch down here and taking it out to the seats by the water is an essential part of a Rotterdam weekend. Drinks | Don't miss the Netherlands' only cider bar. Whilst the term 'bar' may perhaps be a little grand, their selections of both draft and bottled cider from around the world are indeed impressive, and it's run by a lovely chap who is happy to speak about his passion and all the ciders he's sourced. And that's coming from a Herefordian who knows what a good pint of the apple stuff should taste like! 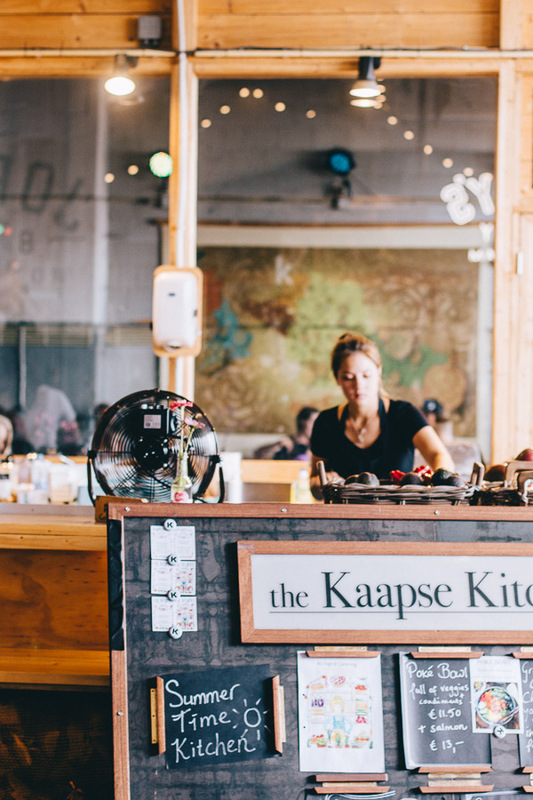 Food | Healthy choices abound at the delightful 'Kaapse Kitchen' (the poké bowl is incredible) but if you're craving some less than healthy carbs, Jordy's Bakery (or more specifically, their cheese toasties) will set you right. The Moroccan place is a good option if you just want a snack, with a variety of tapas and bread on offer, but do note that the portions are quite miserly - and they have a terrible single-use plastic problem. Tip | We had high hopes for visiting the Pinball Museum next door to Fenix, but twice we were thwarted (once because we had to change our plans and the next because it was closed for July holidays!). If you have better luck, let us know in the comments if it's actually worth a visit. Also, cash is best for all the businesses in Fenix and you'll be happy to know there's a free ATM inside the warehouse. For years, the Katendrecht neighbourhood had somewhat of a reputation; a place of dirty deeds and drunken sailors, where ladies of the night skulked in corners and most wouldn't dare venture. The community spirit however has always been strong, and despite the gentrification that has occured in many port districts across the world, Katendrecht is a neighbourhood that maintains a fine balance between old and new; both in buildings, businesses, and residents. Katendrecht has gained a little bit of a reputation as a foodie-hotspot - and not only for the fantastic Fenix that we mentioned above. Fans of Thai food should make a bee-line for Deli Bird (we were gutted it was shut when we wanted to visit), and coffee lovers should check out Kopi Soesoe for an afternoon pick-me-up or one of their intimate music nights. Tip | Those of you who like to throw a bit of guess work, mystery and games into the mix should head over to SS Rotterdam (a steam-powered cruise ship that sailed back and forth between Rotterdam and Manhattan in the 1960s and is now a hotel + restaurant). In the bowels of the ship you can find one of the best escape rooms we've had a chance to experience - find out more via this link. Did you know | Arriving in the early 20th century, Katendrecht quickly became one of Europe's first (and for some time) largest China town in Europe, with more than 1500 Chinese immigrants living alongside the workers of the red light district up until 50 years ago, when they began to relocate to Oude Westen. Social media geo-locations, obscure reading materials and serendipitous interactions with friendly locations; they have each led us to some very unexpected places in new cities. The Van Nelle Factory however may be one of the most interesting so far. Completed in 1931, what was once a processing plant for coffee, tea and tobacco is now considered to be one of Netherlands' largest and most important industrial monuments; and opinion reinforced by its designation as a UNESCO site in 2014. Interestingly, Mr Van Nelle was a key figure following the war in shaping the bold future look of Rotterdam. He effectively mounted a coup against the appointed city planner, viewed as too conservative, to ensure that a more radical approach was taken to the 'blank slate' opportunity to build the city anew. Upon arrival be sure to have a chat with the chap at security (on the left hand side at entrance gate). You are allowed to explore the communal areas, restaurant and small gallery/museum (not open during our visit) but for obvious reasons are not able to access the offices. For the architectural fiends amongst you, consider booking with Urban Guides for a dedicated tour of the factory. Getting there | There are no buses, metro or tram stops nearby, and so a twenty minute journey by foot is required to reach the entrance. After you've taken hundreds of photographs at the Cube Houses, head across the road to one of the other notable 2014 additions to Rotterdam's list of landmarks (seriously, the city must have spent a lot of cash in the run up to that year! ): the horseshoe-shaped Markthal. Rotterdam's blend of 170+ nationalities is encapsulated in the stalls and restaurants housed in this covered market, but it is (unsurprisingly) the building itself which again steals the show. The giant 4,000 tile artwork which adorns the curved ceiling is the colourful "Horn of Plenty", which has led to some tongue-in-cheek references (we assume) to the Markthal as 'Rotterdam's Sistine Chapel'. The most surprising part of the Markthal structure however is the fact fact that there are 228 apartments within the ceiling! Tip | If you want to take photos of the Markthal (because, let's face it, of course you do), we'd recommend going a little earlier - around 11 a.m. - when most of the stalls are open but before visitors really begin arriving. For eating however, a little more atmosphere is required so wait for the busier lunch hour, and opt to enjoy your food from one of the dining areas directly above the stalls. A couple are for customers only of that particular eatery, however others (including the one above the Japanese noodle place) are for anyone. When | Markthal is open daily 10 a.m. - 8 p.m.
Jack Bean | Just across from Centraal Station, Jack Bean is a place that we can really get behind. Serving 100% plant-based fast food (burgers, noodles, wraps and salads), it's cheap and delicious. It had actually just opened up before we arrived in Rotterdam, and the owners have big plans to take the name and menu of sustainable, ethical plant-based fast food global! FYI, their homemade raspberry soda is UNBELIEVABLE! Takumi | We first discovered the Takumi ramen restaurant brand whilst in Dusseldorf, and we were delighted to find that it had found its way to Rotterdam (we think it's only in about five other European cites). You will find it on West-Kruiskade, which is where a large number of Asian restaurants are concentrated in Rotterdam. If ramen at Takumi is a little out of your budget, then make a beeline round the corner to enjoy excellent and very affordable homemade Malaysian at the fantastically decorated Kampong Express on Gouvernestraat 2B. Burgertrut | When asking for recommendations, a few of our followers over on Instagram (see our account here) insisted that we go to this Rotterdam institution, and we are delighted they did! A few minutes walk from Centraal Station, Burgertrut (closed on Mondays) is a very cool place offering all sorts of burgers guaranteed to make vegetarians, vegans, and meat-eaters equally happy. Burgertrut is part of the Roodkapje art collective, and its profits go towards its events and exhibitions. Note that the Netherlands loves Kapsalon (essentially chips, shawarma meat, sauce and cheese) and this place serves a demon vegan version (excellent when hungover). Supermercado | Although the service and veggie options need to improve, Supermercado is a really popular spot for locals with its cocktails and Latin American inspired menu. Bazar | We only made it to Bazar as we had few late-night options available to us, but we are delighted that we found it. On the busy Witte de Withstaat, the bright and colourful restaurant serves up a wide range of delicious North African and Middle Eastern dishes. Perfect for every budget. Hopper Coffee Bar | Viewed as one of Rotterdam's best coffee shops (and they do make a great coffee), Hopper is an excellent workspace for nomads and a good spot for lunch. When it comes to selecting accommodation in Rotterdam, picking the location you want to stay in is vitally important. It's a very walkable city, so much so that we often found it difficult to condone jumping on public transport - if you’re like us, consider the areas that you’ll be visiting for dinner, and where you’ll be heading for local nightlife when finding your digs. Over the course of two visits, we've stayed in several places in the city, and can recommend all three, but we’ve included a selection of other highly recommended spots too. The James | Slap-bang in the middle of the Cool District and only a short walk from Centraal station, this luxurious new hotel (with a boutique-like feel) ticks a lot of boxes. We stayed here and loved it, although it doesn't include breakfasts yet. For more information and to check availability and prices, click here. citizenM | Part of an internationally recognised chain famed for a contemporary and quirky style, citizenM fits in perfectly in Rotterdam. More fancy gadget and gizmos than you can shake a stick at, hu-uuge beds (albeit smallish rooms) and excellent quality design, this hotel offers affordable luxury. For more information and to check availability and prices, click here. The Cube Houses | If we piqued you interest earlier, but you're not keen on hanging out in a hostel, you’ll be pleased to know that there’s a highly rated Airbnb available in the cube houses - check it out here! H2OTEL | Ever fancied staying on a boat? This might just be the accommodation for you! Floating in the Wijnhaven harbour is this charming little hotel. Some of the rooms are a little oddly decorated but staff are great and it’s certainly different For more information and to check availability and prices, click here. Ani & Haakien | We’ve stayed in a lot of hostels, so when we say that a place has got the communal space and vibe sorted, well, take our word for it - this hostel is fabulous. Oh, and the world’s biggest cat lives there. Find out more, check availability and prices on booking.com or hostelworld. The Student Hotel | Part student halls of residence, part contemporary hotel, part very cool long-stay hostel, The Student Hotel caters to all manner of guests looking for seriously sleek design that won’t break the bank. The upsides of its incredible social, work and living spaces are only reduced by its slightly further out location. Find out more, check availability and prices on booking.com or hostelworld. King Kong Hostel | On Witte De Withstraat, you’ll find the perennially popular King Kong Hostel. White walls, distressed wood, cool furniture. Very hipster, very Rotterdam. Their coffee shop also makes a damn good latte! Find out more, check availability and prices on booking.com or hostelworld. Okay, first things first; Rotterdam is a confusing city to get around. We’ve visited twice in the last few months, and we still don’t really understand how to easily get from one spot to another, how every walk seems to end back on Coolsingel or with a view of or walk over Erasmus Bridge. We had a chat with one of the guys behind Jack Bean and, after six years in Rotterdam, the city’s layout still flummoxed him on regular occasions, so at least we’re not alone! We mainly discovered Rotterdam on foot (hitting over 20,000 steps each on at least two days), and this flat and relatively centralised city can be explored on two feet during a city break. If you’re easily confused, don’t have the time to get lost or prefer more direct routes to your destinations, then we’d recommend going with public transport as your primary mode instead. Single journeys cost €3.50, which can definitely mount up if you’re taking more than a two journeys a day, so instead you’d be better of investing in a Rotterdam Welcome Card. It includes discounts to lots of tourist sites (especially useful for museums) but it’s the unlimited public transport for 24, 48 or 72 hours (for €12, €17 or €21 respectively) which really makes it worth the money. Do note that the Rotterdam Welcome Card only includes transport on the metro, tram and bus. There are numerous boat shuttles that are accessible in the city but these require an additional payment (usually not very much) to bring you across the river, and these can be purchased on board if you have change. Alternatively, do like the locals do in the Netherlands and get on your bike. Unlike many other European cities, Rotterdam doesn’t yet have a city-wide public bike service, although they do have some coverage with OV Bike Rental (a cloud-based subscription). Instead, rent from one of several companies within the city on a day or multi-day rate. If you like the idea of cycling about the city, but would prefer to combine it with some time-efficient sight-seeing, consider this 2.5 hour ‘Rotterdam Highlights’ bike tour. Top tip | Even if you're a walker, do make time to take at least a couple of metro journeys. For a city that is so heavily invested in contemporary architecture, it should be of little surprise that design is given as much importance below as above ground, and the metro stations are fascinating places for design-nuts (if you've enjoyed the stations in Stockholm for example, you'll definitely enjoy these).